Kentucky Senator Rand Paul had some choice words for US Secretary of State John Kerry Sunday, throwing his own words back at him to make the point that military action in Syria would have dire consequences for the US. “He’s famous for saying ‘how can you ask a man to be the last one to die for a mistake?’ I would ask John Kerry how can you ask a man to be the first one to die for a mistake?” Paul said during a powerful appearance on NBC’s Meet The Press. Kerry famously uttered the line before the Senate Foreign Relations Committee in 1971 on the Vietnam War, when he was campaigning for Vietnam Veterans Against the War. “I would ask John Kerry, do you think that it’s less likely or more likely that chemical weapons will be used again if the we bomb Assad?” Paul added. “I will ask him if it’s more likely or less likely that we’ll have more refugees in Jordan or that Israel might suffer an attack.” he continued. “I think all of the bad things you can imagine are all more likely if we get involved in the Syrian civil war.” added Paul, saying that any military action would be a grave undertaking. “I see a young John Kerry who went to war, and I wish he remembered more of how awful war is, and that it shouldn’t be a desired outcome,” Paul said. The Senator also pointed out that the US has no interests in Syria and a lack of international support. “I think the war may escalate out of control, and then we have to ask ourselves, ‘Who is on America’s side over there? '” Paul told host David Gregory. “I don’t see American interests involved on either side of this Syrian war. I see [Bashar] Assad, who has protected Christians for a number of decades, and Islamic rebels on the other side who have been attacking Christians,” Paul said. Paul also accused the president of bandying around too much “machismo” with regards to Syria, a move that is now blowing up in his face. “A president should be very careful about setting red lines he’s not going to keep,” Paul said, adding that now he is backing off a military strike somewhat, Obama might be trying to save face. “In my interpretation of the current Obama administration’s policy, they want to fight for stalemate,” Paul said, repeating comments he made in July. “Then they want a negotiated settlement. They think that Assad has the upper hand now.” he added. The Senator also stated that while he is happy that the president is seeking Congressional approval before taking any action on Syria, he needs to abide by the outcome of Congress’ vote, an outcome that is looking increasingly unlikely. 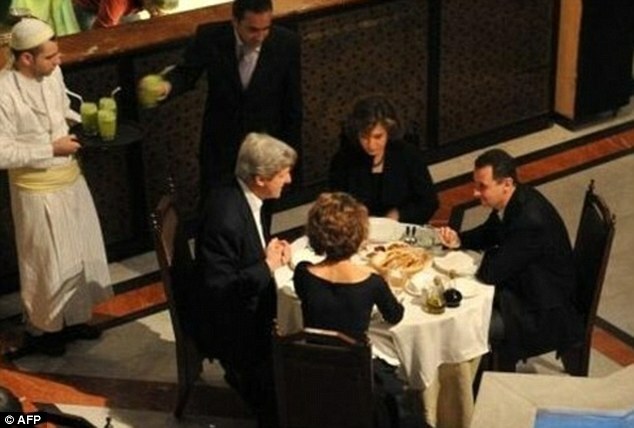 John Kerry himself faces growing embarrassment today after an image of him and his wife dining with the Assads in an intimate setting was published by several mainstream news outlets. It is believed to date from 2009 when Kerry was still Senator for Massachusetts. In an appearance also on Meet The Press yesterday, Kerry compared Assad to Adolf Hitler and Saddam Hussein. Which presumably makes Kerry the dinner guest of the latest evil dictator. Still, he has some way to go to better former US Secretary of Defense Donald Rumsfeld who oversaw the sale of chemical weapons to Saddam and was pictured shaking his hand during a meeting to ink the deal.